Net Literacy’s student volunteers have repurposed and donated over 34,000 computers to families, schools, libraries, and other nonprofits since 2003, and this initiative wouldn’t be possible without the support of socially minded corporate partners. During the last few years, Old National Bank has distinguished itself by an extraordinary commitment to community and sustainability through its donations of more than 800 computers and 400 monitors to Net Literacy. During the 2015 Board Meeting, the Board proclaimed Old National Bank “Computer Connects Partner of the Year” for it’s ongoing and significant donations. “At this year’s annual board meeting, the student board members proposed that we recognize Old National Bank’s incredibly generous donations in support of digital inclusion throughout Indiana in a new way. And so we created the “Computer Connects Partner of the Year” initiative to recognize truly outstanding organizations that go way beyond the expected to support the communities they service by increasing digital inclusion. We’re especially excited and feel that it’s very appropriate that Old National Bank be the first company to receive this honor,” said Dan Kent, Founder and President of Net Literacy. About Old National. Old National Bancorp (NASDAQ: ONB) is the largest financial services holding company headquartered in Indiana and, with $12.1 billion in assets, ranks among the top 100 banking companies in the U.S. Since its founding in Evansville in 1834, Old National Bank has focused on community banking by building long-term, highly valued partnerships with clients in its primary footprint of Indiana, Southern Illinois, Western Kentucky and Louisville, and Southwestern and Central Michigan. In addition to providing extensive services in retail and commercial banking, wealth management, investments and brokerage, Old National also owns Old National Insurance, one of the 100 largest brokers in the U.S. For more information and financial data, please visit Investor Relations at oldnational.com. About Net Literacy. Net Literacy is a student-founded all-volunteer digital inclusion and digital literacy nonprofit whose board is 50% comprised of students. 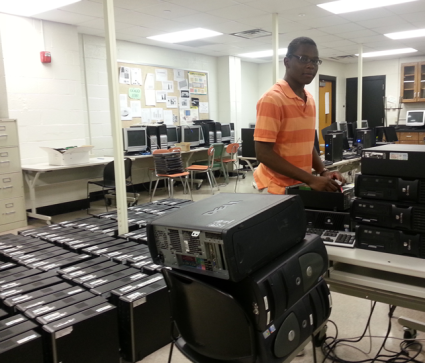 Students have repurposed more than 34,000 computers donating them to schools, afterschool programs, and other nonprofits in more than 80 Indiana counties increasing computer and Internet access to over 250,000 Hoosiers. Three of its programs were included in the National Broadband Plan presented by the FCC to Congress and two American Presidents have honored Net Literacy’s accomplishments. For more information, please visit netliteracy.org.